Don’t give your clients closing gifts right away. Wait about two weeks, and then use it as a reason to visit. Don’t ask for referrals — ask for introductions. Follow-up is key to getting referrals. What systems do you have in place to double your business through referrals with each transaction? Top real estate agents implement great procedures to plant seeds for business referrals from the very first contact they have with a team or company. Sit down and write out what systems you have to generate referrals from the time the lead makes contact with you all the way through the first 12 months after closing. These three tips based on the most effective system we’ve found to generate leads post-closing. Many agents do a great job of asking for introductions to their clients’ network of family and friends, but they are missing out on a huge area of opportunity. There are referral pipelines in your clients’ network that you need to tap into, and here’s how. The easiest way to do this while still getting your foot in the door later is to not give a closing gift at the closing table. Instead, give them a handwritten thank-you note. P.S. I have a gift for you. Once you get settled into your new home, I’ll come out and visit. Then schedule a follow-up in your database or calendar for a call 10 to 14 days after closing. Set the meeting. Show your appreciation, and visit with them. Why choose these professions? They all have influence on your clients and prospects. The average case a divorce attorney refers out to a real estate company could result in three transactions. People — about 12 percent — move each year. If there is an organization with 100 people in it, typically there will be 25 real estate transactions that will occur within that organization every year. Ask for church and school administrators and board members. Ask for people who are in the human resources department of larger corporations. When people think of you, do they think of you as a real estate agent or a real estate professional? Once you get leads to these great contacts, reach out. A simple call: “Hi John, I was referred to you by (clients’ names). We recently helped them (buy/sell) their home, and they thought we should connect. Visit. Give referrals to others. Receive referrals from them. 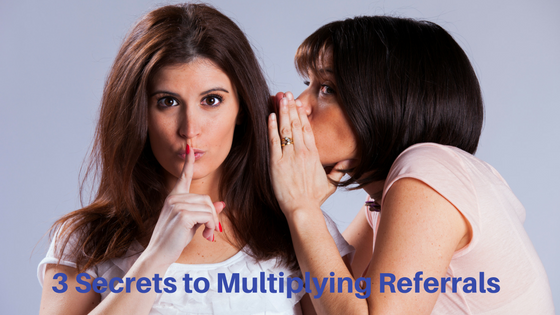 Give referrals to businesses you partner with, and receive referrals from them. Put the time in your calendar, and watch your referrals increase two or three times over using these simple tips.